Bashar Albdewi is what a lot of his friends and neighbours call a “master of hummus". He potters around the cavernous kitchen gathering the ingredients for an inordinately large batch of hummus at Sharehaus Refugio, a community living project for refugees in Berlin’s multicultural Kreuzkölln neighbourhood. The 20-something from Daraa, Syria, is very particular about the tiniest details—from the exact firmness that he wants the chickpeas to retain after boiling to removing every shred of skin from the last chickpea. All of these, he insists, will add to the smoothness and texture of the hummus. As he rubs the chickpeas between his palms, he talks about the life he left behind in war-torn Syria where he had started training as a chef. He talks about his mother’s recipe for hummus, which is imprinted in his mind, and how he has tweaked it based on all the other variations he tried in restaurants across Syria and Berlin. He says he is very close to making what according to him is the perfect hummus. While Albdewi is studying mechatronics and pursuing an internship with Siemens in Berlin, his love for Syrian food remains intact. He often cooks up meals for his housemates at Sharehaus and at the Refugio café which operates out of the ground floor of the same building. This particular batch of hummus is for an office picnic and Albdewi wants to make sure that everything tastes just fine. For him, hummus isn’t just another ordinary dip but a way to recreate the memories and culture of his home in Syria even as he builds a new life in Germany. Hummus as a dish has a cultural resonance that is even stronger than its culinary merit. While the base ingredients might be the same tahini-chickpea combo, it is the spice mix, the saturation of the lemon, and the texture and consistency that make all the difference to an accustomed palate. There is rarely any consensus about which country invented the hummus—all the way from the Middle East to the Mediterranean—and whose version is the best. Hummus is a symbol in ways more than one, offering a recipe for peace in the midst of conflict and war, recreating a homeland that has been left behind. Israel, Palestine, Egypt, Lebanon, Turkey, Syria and Greece, all lay claim to the hummus and its place within their culinary heritage. The dish has been the subject of more than one documentary film, including Make Hummus Not War directed by Trevor Graham and Oren Rosenfeld’s Hummus! The Movie. Both films are humour-filled personal takes on hummus and its power to unite people beyond their political and religious divides. As Graham writes in his director’s statement, “Hummus and chickpeas are a symbol of our common humanity, our common ancient roots to live, eat, taste and enjoy life." In Berlin, hummus found a ready home and easy acceptance. With its large population of guest workers from Turkey and Vietnam who arrived in the 1960s and the 1980s, the distinct identities of the east and west after the fall of the wall, Berlin has always been a place where cultures have clashed, coexisted and melded. The large exodus from the conflict-ridden countries of Syria, Iraq, Afghanistan, Pakistan and African countries like Chad, Egypt, Sudan, Eritrea, and Angela Merkel’s open-door policies, brought over one million refugees to Germany in 2015 alone. And Berlin took the lead in welcoming them, a move that added to the city’s multicultural fabric and diverse culinary culture. Today, hummus is omnipresent across Berlin—in the Turkish snack bars that bookend every street, in the restaurant strip of Sonnenallee (a street in the Neukölln neighbourhood) packed with migrants from every corner of the Middle East, behind the gleaming glass cases in speciality Arabic stores, and in hipster vegan cafés. In the smorgasbord of food offerings in Berlin, hummus always has a starring role—in Middle Eastern mezze platters, generously slathered inside a fat Turkish doner kebab, or a Greek gyro roll, or served with freshly baked pita and assorted meats, sauces and pickles. Supermarket racks are nearly always stacked with different kinds of tahini and cans of chickpeas. There are restaurants dedicated to hummus and festivals that bring together hummus-makers from different countries, many of which are politically at odds with each other. It is a tough call to choose between two of the city’s best hummus speciality restaurants, Kanaan, a Middle Eastern vegan restaurant run by an Israeli businessman and a Palestinian chef, and Azzam, a Neukölln legend run by a Palestinian chef. Nestled in Sonnenallee, also called Berlin’s Arab Street, Azzam is a place where people come for a hearty meal, conversations, excellent hummus and a taste of their homeland. Run by Mansour Azzam, an erstwhile Palestinian guerilla fighter who arrived in Berlin in the 1990s, the restaurant is a neighbourhood icon. Most of his staff is Syrian while the patrons are a motley crew of locals, tourists and Germans looking for good hummus. The turnaround time in Azzam is uniquely disproportionate to the size of their plates. The hummus is a generous plate of a classic creamy Palestinian version, redolent with olive oil, fresh lemon juice, cumin, garlic and also whole chickpeas nestled in the central well. It comes with a plate of pickles and pita. To this, patrons add their choice of vegetarian or non-vegetarian mezze and all of this under €10 (around ₹ 850) a head. At Kanaan, hummus is both the star of the menu and the means to make a political statement. 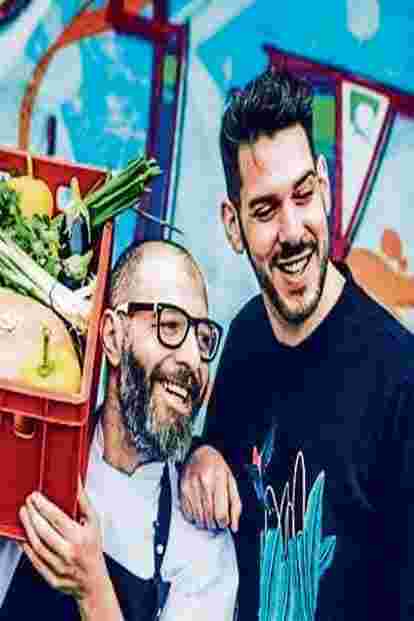 It was started by Oz Ben David from Israel and Jalil Dabit from Palestine with a kitchen staff that includes people of Syrian, Kurdish, German, Italian, British, Australian, Moroccan descent. The flavour and recipe of even a basic hummus depends on who is making it that day and sometimes the difference is nuanced to the point of a few extra drops of lemon juice. They also do different versions of hummus inspired by the different countries, so there is a hamshuka from Jerusalem, a combination of egg shakshouka and hummus, a traditional Palestinian hummus, the masabacha, and sabich, an Iraqi-Jewish sandwich which is hummus in a pita with boiled egg, fried aubergine and a curried mango sauce called amba. The only thing that remains common to all the different versions is the high quality of ingredients and the focus on freshness and tradition. Kanaan also uses a high-quality traditional tahini that is imported from Lebanon from a family that has been making it for generations. This attention to small things bumps up the prices and the cheapest thing on the menu is a small plate of classic hummus priced at €4. For Ben David, food is a signature of cultural ties and history and he gives an example of this: “In the sabich, we use the curried mango sauce called amba which is very similar to the Indian mango chutney. When I started doing more research, I discovered that there was a large population of Baghdadi Jews in the port cities of India. They discovered a taste for mangoes which were then pickled and sent to Iraq from where it became a part of this dish," he says. According to him, hummus is defined by the terroir of the land and the history of the family that makes it. And this is the story of hummus in Berlin, a journey from the past to the present that blurs political and personal divides.